It may be the best business name in town. It may also be the best business idea ever. “Baked and Sauced” is a converted Airstream trailer. It comes to your home or business, parks, serving scrumptious desserts and fantastic craft cocktails for your wedding, neighborhood party or corporate event. “Baked and Sauced” — get it?! The clever concept — rolling bakery and bar — and ingenious execution come courtesy of Mike and Kathy McGovern. She’s from New Hampshire, but spent the past 25 years in Connecticut. Kathy owned a Fairfield bakery called “Muffin But the Best” — memorable business names are a McGovern family trait — and now works for a small family newspaper chain in Wilton. They got married 3 years ago. Kathy wanted to take her baking talents to the next level. But it’s a competitive field, and she needed a hook. 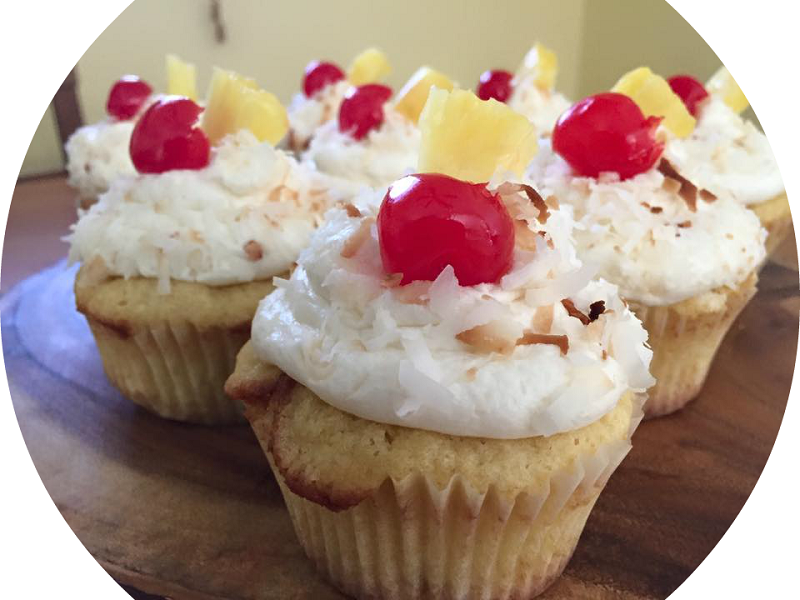 Pina colada cupcakes: Pineapple rum cake with coconut buttercream frosting. Yummmmm! One of her specialties is alcohol-fused desserts. Most bakers put liquor in the cake itself; you get the flavor, but not the “pop.” Kathy put it in the filling and frosting, so it didn’t bake off. Her desserts — including cupcakes and brownies — tasted like cocktails. Kathy’s sister lives in Austin, Texas. While visiting, the McGoverns saw the legendary Gourdough’s food truck. The owners specialize in doughnuts. (Mike calls the “Fat Elvis” — grilled bananas and bacon with peanut butter icing and honey — “unbelievable”). A light bulb went on in the McGoverns’ heads. 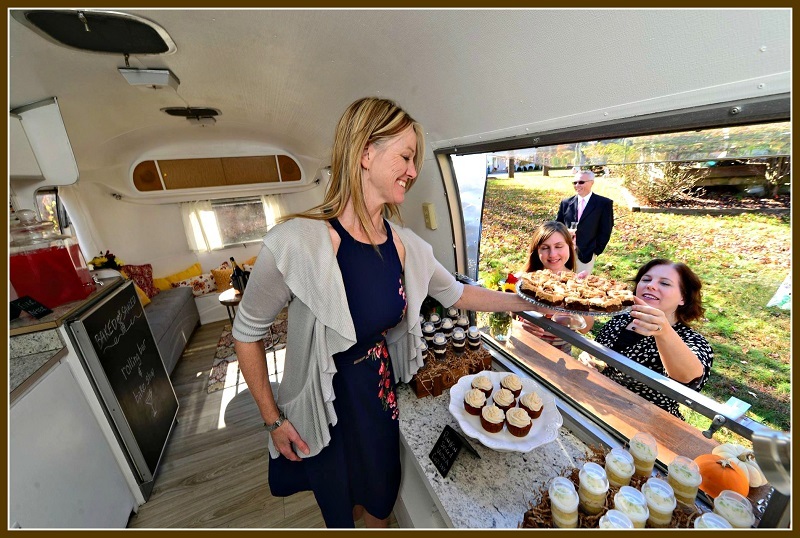 Vintage Airstreams are as rare as trucks selling “Heavenly Hash” doughnuts, though (marshmallow with chocolate fudge icing, topped with brownie bites). Finally, a year ago, the couple found a 1968 model in Indiana. It was in rough shape, so they got a good deal. The dealer spent 15 minutes showing them what they needed to know. Then — though neither had ever towed anything before — they headed back to Westport. The trailer sat in Mike’s mother’s driveway on Jennie Lane for several months. Whenever they could, the McGoverns worked on it. 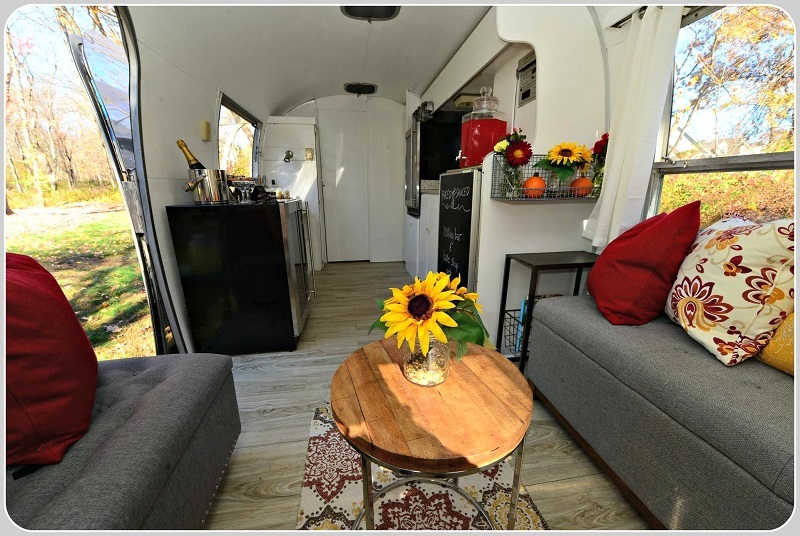 Guided by YouTube convert-your-Airstream videos, they put in a new floor, built shelves, and gave it a clean, sleek, modern interior, while keeping the rustic exterior. Mike and Kathy McGovern, with their converted Airstream trailer. The neutral tones inside can match up with any wedding color scheme. The McGoverns know which side their bread is buttered on. Mike and Kathy trademarked the “Baked and Sauced” name, designed a logo and put up a Facebook page. Then they — and their business — took off. Last summer, they did weddings (one in a backyard, one at the beach, one rehearsal dinner) and several parties. The interior of the trailer. Come on in and party! The McGoverns have a catering/liquor license. “Baked and Sauced” is not a food truck — otherwise they’d be called “Baked, Sauced and Toasted” — so they cannot ride around like the Good Humor Man, searching for business. That’s fine. When it comes to food and drink, there’s plenty of room for everyone here. Unless the Good Humor Man starts offering pumpkin-spiced vodka Creamsicles. 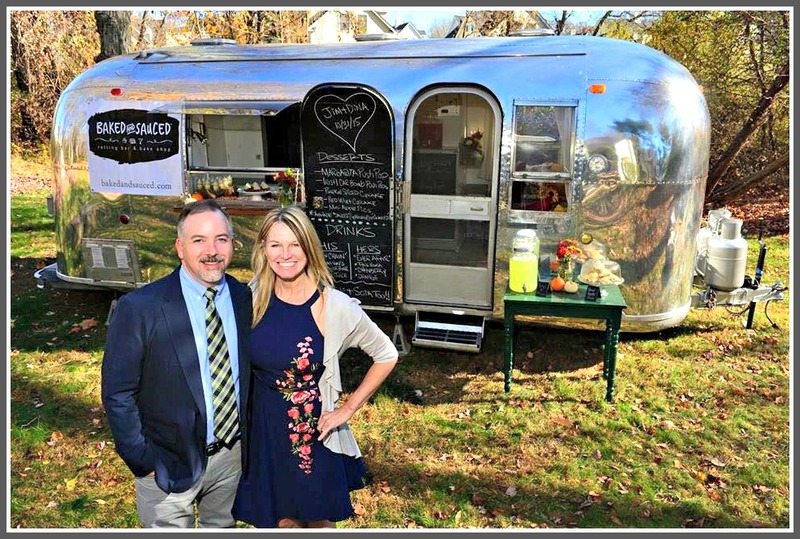 This entry was posted in Local politics, People, Restaurants, Totally random and tagged " Mike McGovern, "Baked and Sauced, Airstream trailer, Gourdoough's, Kathy McGovern. Bookmark the permalink. Fantastic!!!! Good Luck to you, love your idea and it seems beautifully executed! I wanted to stand up and clap!! Dan-you must invite them to the next 06880 gathering. Just think of the conversations after a few juiced cupcakes and special cocktails!! Great minds think alike. I had the same idea! Everyone in Westport is cordially invited to Portland Oregon to see the most amazing fleet of …well, they used to be called food “carts.” Now, they are rolling kitchens whose cuisine is — no kidding — reviewed in local newspapers and regional magazines. Same here in Tucson…our food trucks are legendary, especially the ones with the Sonoran Dog. Lots of Mexican, Carribean, Sonoran, rolling trucks, but also Crepes, Oriental, Tex-Mex, Mexican, Shrimp and other specialities. And, Like John’s our are reviewed in magazines and newspapers, and have lengthy Yelp Reviews. Ditto from Vancouver (B.C., not Washington). Come and choose from a huge variety of cuisines, before the Wall is built! Nancy, is the Wall to keep Washingtonians out? J-period. You’d have to ask Trump. I’ve always considered the Pacific Northwest as one “territory”, that Oregon, Washington and British Columbia belong together. It’s only natural.